There was an air of collusion at this year’s Darwin Festival as three highly technical productions brought audiences closer to the process of theatre-making. In Lippy, by Ireland’s Bush Moukarzel and Dead Centre, the playwright, producer-director and sound designer were also performers. Filipino performance company Sipat Lawin Ensemble presented Gobyerno (government), involving the entire audience as writers, cast and crew in the production. 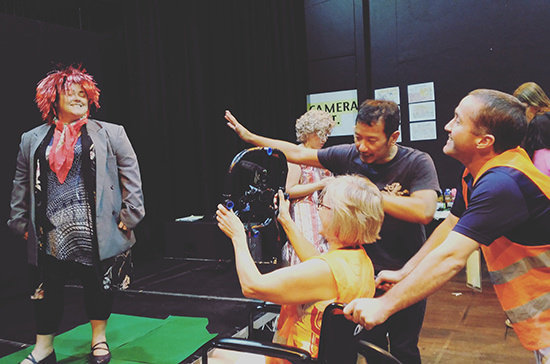 And Australia’s Terrapin Puppet Theatre created the sights and sounds of strange worlds onstage with an animator and musician in You and Me and the Space Between. Lippy challenges perception on every level. It begins, surprisingly, with a ‘post-show’ discussion in which producer and co-director Bush Moukarzel, playing a version of himself, interviews the lip-reader. Too late, his subject is questioning the ethics of telling the women’s story. In reverse his experience unfolds. The technician (sound designer Adam Welsh) sits on stage layering and disrupting live and recorded sound, video and live performance. YouTube’s Bad Lip Reading is turned on its ear putting real words in the mouths of the disempowered, instead of fake words into the mouths of the powerful. The gravity-defying set tips this jagged world even further off-kilter. Designers Andrew Clancy and Grace O’Hara juxtapose floating bin bags and biohazard suits with leaf blowers and a leaky roof. 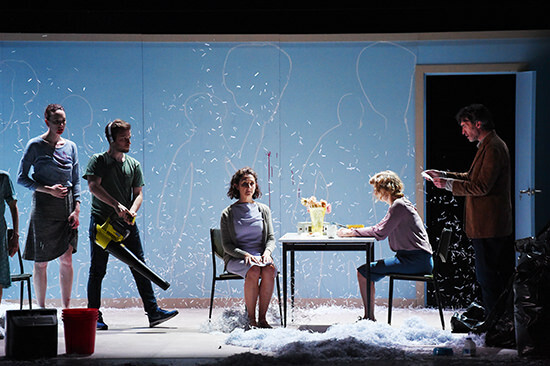 In a tableau-esque depiction of their last days, the women (played by Joanna Banks, Ali White, Clara Simpson and Liv O’Donoghue) interact on ever shifting planes. The realisation of their act of starvation is hypnotic. Lippy is a surreal experience. Memories, contexts and interpretations are warped by time and shifting perspectives, leaving us wondering who controls the way we are perceived in life, and in death. Gobyerno is putting government back into the hands of the people. From the outset the audience is engaged, dancing into the theatre with their “one big idea” held high on cards. Eventually like meets like and everyone settles at work benches, tasked with agreeing on our “most urgent” policies. Guided by members of the ensemble (which includes Australian David Finnigan as dramaturg and facilitator) wielding the Dice of Reason, the pros and cons of each suggestion are considered. Agreement came easily and energy levels, already high, cranked up a notch as hit music played while new teams were formed. The audience self-selected into groups of performers, costume designers, set designers, sound designers and urban planners. With a party atmosphere, basic materials and plenty of ingenuity, within 15 minutes we were ready to rehearse a State of the Nation Address. The theatre transformed into a film set ‘in the round’ and the Ensemble put everyone through their paces, blocking the show. Soon, clapperboard at the ready, we were ready to make history. That night, Gobyerno did us proud. Sipat Lawin Ensemble’s process was sustained, focused and liberating, giving people an opportunity to speak up and act—on stage at least. Their ideas will join with those of other Gobyernos from around the world on YouTube. The world premiere of You and Me and the Space Between was a magic carpet ride of puppetry. 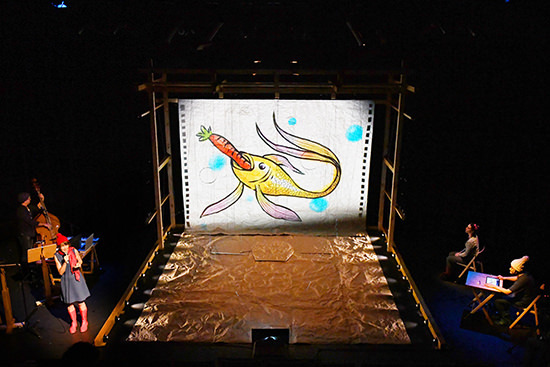 Choreographed projections, live drawn animation and performance explored the plight of refugees fleeing environmental change through the eyes of a child. Written by Finegan Kruckemeyer, the work is the story of Eve whose blissful life is disrupted when her island springs a leak. Narrated by Emily Tomlins, the production was rich with childlike whimsy and wisdom, read in lilting story-time style. Between the tale’s two worlds, The Proud Circle and The Long Cliffs, we saw fantastic images: The Final Circle, where old people went to die, un-animals, fish that eat carrots and the obligatory angry giant. Designer Jonathon Oxlade and lighting designer Nicholas Higgins created deceptively simple backdrops and props that doubled as screens. A single hole in the backdrop was at times a leak, an eye, a mouth, a planet or an island. A tarp on the ground was the ocean and then cliffs. Effortlessly (it seemed), puppeteer Felicity Horsley manipulated all the moving parts. With keyboard and cello, musician Dean Stevenson generated storms, moods and fun, as well as voicing the characters and crowd scenes. On the other side of the stage, hand flying across his tablet, sat cartoonist Badiucao drawing animated places and creatures projected live onto multiple screens. The production was fast-paced. I wanted more time to enjoy Badiucao’s drawings, more time to dwell on Kruckemeyer’s words. With its happy ending, befitting a fairytale, You and Me and the Space Between was a memorable journey for Eve and audience between two imaginary cultures.